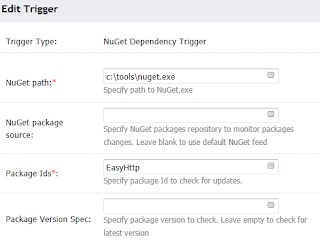 In this blog post I introduce a plugin for TeamCity 6.5 that provides support for NuGet. Installation of packages that were not checked in to version control was also covered on David Ebbob post. Internally, we use NuGet.exe install and NuGet.exe update commands for it. As you use NuGet Packages Installer in the build, you may want to know what exact versions of packages were used in the build. 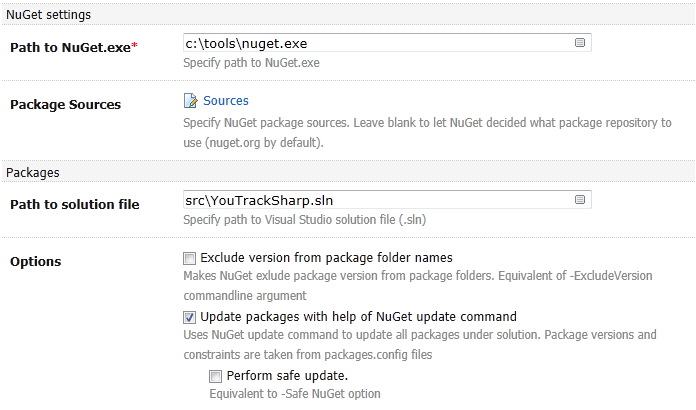 For this we provide a 'NuGet Packages' tab for every finished build. Do you want TeamCity to run a build if a build packages are updated? Use NuGet Dependencies Trigger for it. 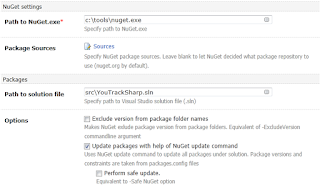 It will start a build if there is a NuGet packages update detected in NuGet repository. Plugin provides support of custom NuGet package sources or feeds.